Terryn asks: Who invented the elevator? The history of the elevator, if you define it as a platform that can move people and objects up and down, is actually a rather long one. Rudimentary elevators are known to have been in use in ancient Rome as far back as 336 B.C., with the first reference of one built by the talented Archimedes. These early elevators were open cars rather than enclosed ones, and consisted of a platform with hoists that would enable the car to move vertically. The hoists were typically worked manually, either by people or animals, though sometimes water wheels were used. Romans continued to use these simple elevators for many years, usually to move water, building materials, or other heavy items from one place to another. 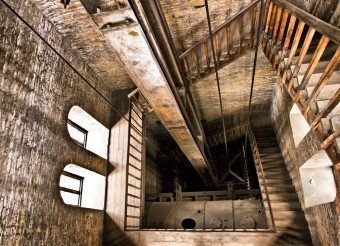 It wasn’t until the 1800s that elevator technology really started to advance. For starters, elevators no longer needed to be worked manually. In 1823, two British architects—Burton and Hormer—built a steam-powered “ascending room” to take tourists up to a platform for a view of London. Several years later, their invention was expanded upon by architects Frost and Stutt who added a belt and counter-weight to the steam power. Soon enough, hydraulic systems began to be created as well, using water pressure to raise and lower the elevator car. However, this wasn’t practical in some cases—pits had to be dug below the elevator shaft to enable the piston to pull back. The higher the elevator went, the deeper the pit had to be. Thus, this wasn’t a viable option for taller buildings in big cities. So despite the hydraulic systems being somewhat safer than steam-powered/cabled elevators, the steam powered ones with cables and counterweights, stuck around. They had just one major drawback: the cables could snap, and sometimes did, which sent the elevator plummeting to the bottom of the shaft, killing passengers and damaging building materials or other items being transported. Needless to say, no one was jumping to get on these dangerous elevators and so passenger elevators up to this point were largely a novelty. The man who solved the elevator safety problem, making skyscrapers possible, was Elisha Otis, who is generally known as the inventor of the modern elevator. In 1852, Otis came up with a design that had a safety “brake.” In the event that the cables broke, a wooden frame at the top of the elevator car would snap out and hit the walls of the shaft, stopping the elevator in its tracks. Otis himself demonstrated the device, which he called a “safety hoist,” at the New York World’s Fair in 1854, when he went up in a make-shift elevator himself and had the ropes cut. Rather than plummeting to his death as the audience thought might happen, his safety hoist snapped out, catching the elevator within seconds. Needless to say, the crowd was impressed. Otis went on to found his own elevator company, which installed the first public elevator in a New York building in 1874. The Otis Elevator Company is still known today as the world’s largest elevator manufacturer. While the cable elevator design has remained, many additional improvements have been made, the most obvious of which is that elevators now run on electricity rather than steam power, a change that came about starting in the 1880s. The electric elevator was patented by Alexander Miles in 1887, though one had been built by the German inventor Werner von Siemens in 1880. Otis’ safety hoist wasn’t the end of safety innovation, either. These days, it’s virtually impossible for an elevator to plummet and kill passengers. There are now multiple steel cables to hold the elevator’s weight, plus a number of different braking systems to stop an elevator from falling if the cables somehow snap. If, despite all these safety measures, the elevator does fall, there are shock absorbers at the bottom of the shaft, making it unlikely death will occur and reducing the possibility of serious injury. Elisha Otis is not considered to be the inventor of the modern elevator by everyone. Another man, Otis Tufts, patented an elevator design that had doors that opened and closed automatically and benches inside. However, Tufts’ design did away with the typical cable system because of the safety issues, and instead used an impractical, expensive system of threading the elevator car up a giant screw. Obviously, this would be prohibitively expensive in tall buildings. Elisha Otis’ design was much simpler (and closer to modern designs), easier to use, and less expensive to make, which is why he generally gets the credit and not Tufts. That said, the “Vertical Screw Railway” was installed in a few buildings in New York and Philadelphia. The first elevator shaft was put in a building before Elisha Otis designed his safe, steam powered elevator. This was done in 1853 at the Cooper Union Foundation building in New York. Peter Cooper felt that elevators would be perfected and made safe at some point in the near future, so included it in the design of the building. It took a couple decades, but an elevator was eventually installed in the shaft by Elisha Otis’ company. Elisha Otis was born into a farming family in 1811, but he spent a lot of time at the blacksmith’s as a child, fascinated by tools and making things. He created a number of inventions to help out around the farm, including a pulley and lift system. At one point, he also worked in a bed-making factory and built a machine that increased production rates significantly. Otis’ daring elevator safety demonstration at the World Fair was hyped up by Phineas Barnum, who is also responsible for making phrases like “jump on the bandwagon” popular. Otis Tufts also invented the steam-powered printing press and steam-powered pile driver.